Passengers wait to board an arriving train. Many emerging concepts in sustainable transport are on the rise today that show potential to be adopted by a wide range of cities in the near future. This evidence prompted us to investigate the proverbial “tipping point” in sustainable urban mobility. Photo by linuscheng07. This is the third post of the “Sustainable Urban Transport On The Move” blog series, exclusive to TheCityFix. Preparation of this series was possible thanks to a grant by Shell. Its contents are the sole responsibility of the authors. In previous blog posts of this series we focused on the need for a paradigm shift in urban mobility and the changes in the demand side for urban mobility spurred by generational changes. 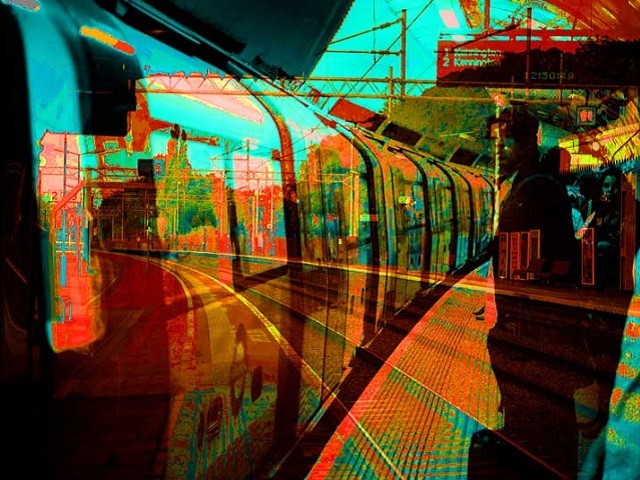 Starting with this post, we’ll feature selected “supply side” sustainable mobility solutions. These emerging solutions for the transport community will help address the vast challenges we are facing: increasing road fatalities, air pollution, physical inactivity, and greenhouse gas (GHG) emissions. We’ll take stock of whether we are making progress beyond rhetoric from a solutions perspective rather than from the impact side – an approach that is heading most countries in the wrong direction. Where are we now? Let’s use a model to answer that question. The “Diffusion of Innovation” theory from Everett M. Rogers can serve as a basic framework for examining sustainable mobility solutions. We will locate where various mobility solutions are in the innovation adoption curve, and whether they have crossed the critical point at which implementation is unstoppable, known as the “tipping point”. The “Diffusion of Innovation” theory is generally used to explain the process by which an innovation is communicated over time among members of a social system. The social system subject to innovation is comprised of individuals that can be categorized into five categories: innovators, early adopters, early majority, late majority, and laggards (See Figure 1). Each category of individuals acts to influence the next group through idea diffusion. Figure 1. Five Stages of Diffusion of Innovation. Graph courtesy of Marco Derksen. The process of idea diffusion does not always occur naturally. 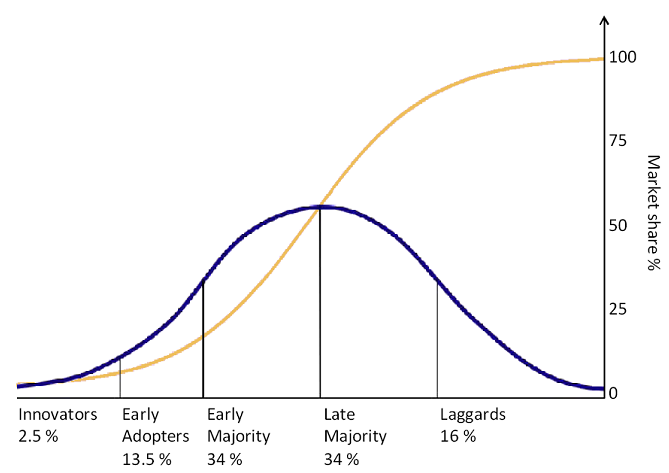 In many social systems there is a gap between early adopters and early majority, which was coined as “the chasm” by Geoffrey A. Moore in Crossing the Chasm. Bridging that gap does not always happen gradually. There are cases in which the change is sudden. Once the innovation “crosses the chasm”, it is considered to have reached a “tipping point”. After this point, growth continues at an exponential rate until reaching the early majority of the population. Adoption then slows down as late majority and laggards still resist change. This is the path the automobile followed throughout the changes of the last century. Inventions were rare during the last part of the 1800s, and only about 2,500 vehicles sold in the U.S. in 1899 by thirty different manufacturers (innovators). The tipping point occurred when Henry Ford introduced the Model T in 1908, the same year General Motors was founded. Mass production and standardization helped cross “the chasm”, and by 1913 a total of 485,000 automobiles were sold (early adopters). In 1927 the Model T was withdrawn from production, but 15 million units had already been sold: “automobility” had become a reality. 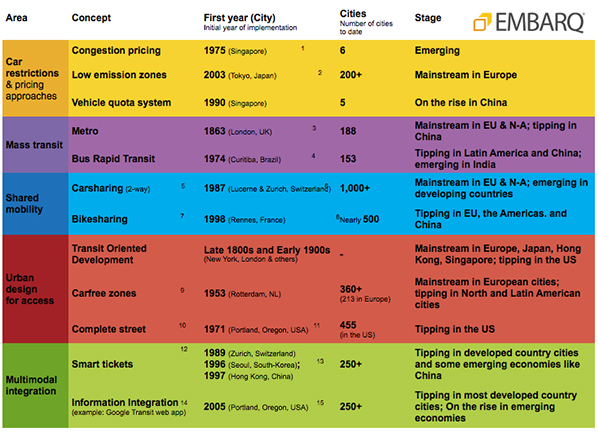 In sustainable transport development, idea diffusion can be seen as the scaling-up process that takes place across various geographies, mainly through the replication and adoption of new concepts from one city to another. The tipping point will occur when the adoption process accelerates from few cities to many cities, so that what were just a few iconic projects becomes the widespread norm. Where are sustainable transport solutions located in the adoption curve? In our upcoming blog posts we will examine five areas of tranport: car restrictions and pricing approaches, mass transit, shared mobility, urban design for access, and multimodal integration. Through consulting with experts with on the ground experience in sustainable transport deployments around the world, we will determine where they are located on the 4-stage advancement curve. Although we won’t be exhaustive, we will try to represent the most relevant concepts in sustainable urban transport, with a focus on policies avoiding personal motorized transport, and shifting demand towards public and shared modes. Figure 2. 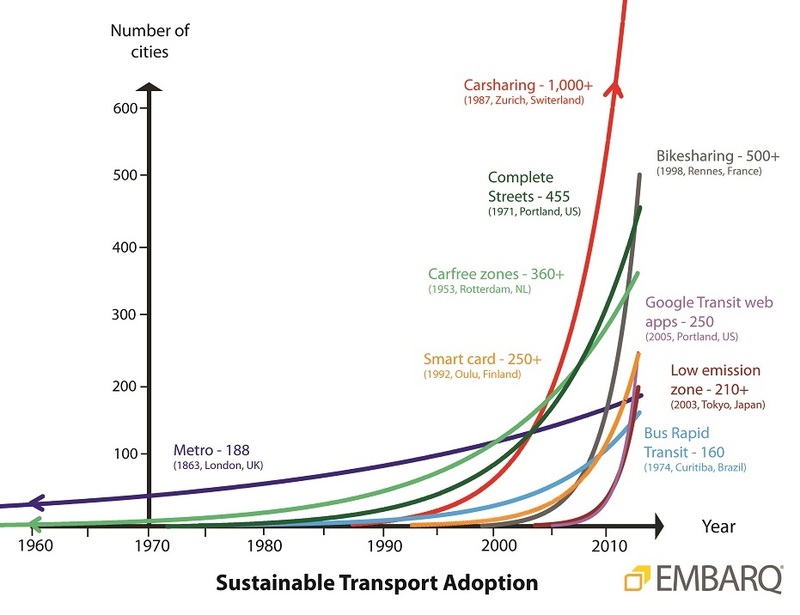 Sustainable Transport Adoption Curves. Graph by EMBARQ. Many emerging concepts in sustainable transport that show potential to be adopted by a larger number of cities in the near future are on the rise, including congestion pricing and vehicle quota systems. Some concepts are undergoing tipping growth toward becoming mainstream, like bikesharing, bus rapid transit (BRT), and smart tickets. Still others that are already mainstream in industrialized economies are now emerging or tipping in developing regions, such as low emission zones, carsharing, and metro. A “new normal” is underway. Most of the concepts we’ll review have or are in a process of crossing the proverbial “tipping point”. Whether this paradigm shift will maintain its momentum is uncertain, since it will require generous enabling policies and finance, as well as developments in the private sector. Keep an eye on this series to find out the latest information and discussion on sustainable urban mobility. Stay tuned for the next On The Move blog post. See also the first post of this series: On the move: Steering urban transport in a new direction, and the second post: On the move: Younger generation mobility trends.